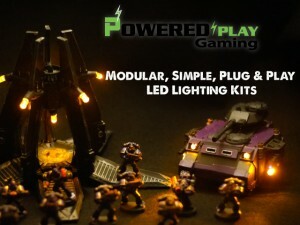 PoweredPlay Gaming is in their final days over on Kickstarter for their revamped modular LED lighting kits. They've made it past their goal, so it's looking to see how many more stretch goals they can make it through. We just received our first test run of the Mini 9V Battery. As you can see it is much smaller than the ubiquitous AA battery. This is available as an add-on to any support level of our Kickstarter campaign for $8 each; which is quite a discount from the MSRP of $10.95.